There are so many things that you can do. If you can learn how to change the ‘cannots’ into ‘I cans’ it’s amazing what you’ll be able to accomplish. Fear holds you back but it’s your will that builds you up and helps you to truly experience life to the fullest. A few weeks ago, my derby league scheduled two time slots to go through our benchmarking skills; that is, to be adjudicated to see if we, as skaters, have the basic skill set to participate in official bouts. Though I laced up to go through the different tests, I was not going with the expectation of passing because, despite having been skating for two years, I’d never been able to make a practice where our skaters learned to jump over an object raised to six inches from the ground. I was game to go through the test – it was an opportunity to learn – but fully expected that, when I took off and tucked both legs to clear the stick, my skate-heavy feet wouldn’t find their way back under me. Sometimes you have to trust that your feet will find their way. 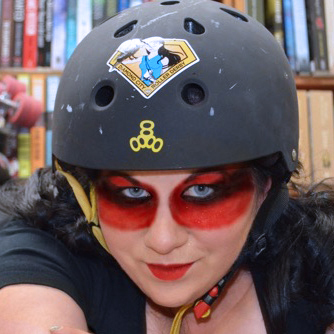 For those of you not familiar with roller derby beyond portrayals in the media, you might think that participants are hard men and women, their bold hair and inked skin signs that they are unforgiving of anything less than angry perfection on the track. Nothing could be further from the truth. Each derby skater I’ve met, whether my rec league teammates or guest coaches who skate competitively in cities bigger than our own small gem, has been sweet and supportive. With their encouragement, I wasn’t afraid to be afraid to fall. This isn’t the first time bravery has been a choice for me. Ten years ago, I was looking at a nearly empty passport and lamenting that, despite having done my Masters overseas, there were very few stamps in it. I’d studied in Scotland, made easier by the fact that my best friend was coming along with me to live and work in the country she’d always dreamed of living in. I’d simply picked the city, she’d told me. Living expenses, however, were high, and she couldn’t afford to travel around Europe at the time, and I was too frightened of being alone to attempt it. My explorations were limited to Edinburgh and a few trips within a few hours’ drive with classmates, tours of Skye, Glasgow, and St. Andrew’s with my visiting parents, and a grad trip to Paris with my dad. Over a year with the sites of Europe within my grasp, and then years at home when I’d missed out on other opportunities to see the world because I couldn’t find someone who could commit to going with me. Things I could have missed if I’d given in to fear. I longed to travel. To be, as it was so aptly put recently, a ‘flaneuse’, wandering the world without a set direction except that to which my heart wanted to beat. But with no partner and friends who enthused about exploring with me but couldn’t commit given their own life and work responsibilities, I found myself recognizing that I had to make a choice. I could let fear of traveling as a woman alone keep me in a pattern of waiting indefinitely, or I could choose to be brave. To feel the fear and do it anyway. Like a key turning in a lock, something within me clicked open, unfurled. Courage wasn’t a feeling. It was a choice. And I’d made it. My friends could join me or not, but I’d make my own plans, cut my own path. I’d be open to taking my own adventures. Sometimes these adventures have been travel; in ten years, I’ve knocked Las Vegas, New Orleans, Greece, Italy, and Australia off the list of places I wanted to see, among others. Other times, it’s meant choosing to let an adventure into my regular life, to say yes to opportunities that presented themselves such as learning a new language, taking an adult dance class, playing a season of softball, wielding a sword in fencing, and (most recently) participating in “an experimental creative group blog”. I travelled to Athens alone, despite the unrest. The only thing I regret is not speaking Greek. Yet. Trying something new can be scary, fear is an old friend, but now that I’ve decided to move with it, I don’t let it stop me in my tracks. Sometimes you just need to open your eyes, take the leap, and know that if you fall, you can get back up again. And sometimes, to your own surprise, your feet find their way back under you.